And now they are both gone. We think the other one flew out a gap in the netting at the top of their pen. We will hope that their natural instincts were simply unbeatable and that they migrated with a passing flock, but Oldest Brother was hiking around the back of the forest and found fresh bones and feathers which may or may not have been duck. I can’t think of this whole thing without a sigh and a substantial helping of guilt. It’s just been unfortunate all the way along. So we throw open the door of their stall (for air? it doesn’t have a roof…), throw away their cracked and filthy kiddie pool and start thinking about housing little goatlets there in May. We are planning to separate overnight and then milk in the morning. I hope this (human) baby sleeps! Otherwise I will have to start napping with baby or figure out how to build udder covers so I can milk in the evening. Sleep, baby, sleep….. We also met with our neighbor goat-lady and she sold one of her bucks and has two empty pens, so we’ll drop off our girls the Saturday before Thanksgiving and they will just stay there until they are bred. She is only charging us a dollar a day for boarding and breeding, which is essentially just the cost of hay. It’s a pretty wonderful deal. I don’t do everything the way she does and she thinks I’m a little nuts for it, but all-in-all she’s been great, made this whole dairy goat thing possible for us and I am very grateful. Penelope is a 5 on her right teat and a 1 on her left. Since I milk facing her back end my right hand ends up significantly more sore and tired than my left. That’s ok, I’ve toughed out worse. Angel, though, is sometimes a 5 on both sides, but sometimes ends up more of a 4 or 6 on one side or the other which necessitates my holding the bowl up right under that teat or losing 1/2 to 2/3 of the milk from that side onto the stand, the wall, her legs or my lap! Seriously! Does anyone know how to adjust a goat’s nozzles? Tags: ducks, goats, planning, the barnyard | Permalink. Back when we first moved here, my husband went out to buy a dozen chicks. We had raised chickens back in Oregon and had a good idea of their needs and I was pretty confident that I could get a coop built before they got big and needed it. I had been reading a couple of days before and had mentioned to my husband that this particlar author suggested that ducks could be helpful with fly control–that maybe we might consider getting ducks at some point to help with that. Well, he went for 12 babies and came back with 14, 3 Rhode Island Reds, 3 Barred Plymouth Rocks, 3 Ameraucanas, 3 Buff Orpingtons and 2 Mallards. Now, ducks are not chickens. First, they are obsessed by water. Chickens may make a bit of a mess, but with ducks, it’s intentional, they like soggy. Chickens may try to roost on the waterer because it’s a high point in the brooder, but ducks really want to spend most of the day sitting in the waterer simply because it has water in it. Ducks also dabble, meaning that they get a mouthful of food and then go swish their bills around in their water until it’s sloppy and then, finally, swallow. If you’ve ever shared a drinking glass with a two-year-old you’ll have some idea of how this affects the cleanliness of the water–except that it’s much, much, much worse. Between their sitting in it and dabbling in it, clean water is nearly impossible. This means you really cannot brood ducks and chickens together, unless you do not worry about the same things I do, I guess. Fourth, they do like flies, but they are still ducks. When the flies were so terrible this Spring we tried putting them into the goats’ stall. They waddled around and ate flies like champs, but they dabbled and they sat in the goats’ water bucket and I determined that one cannot raise ducks and dairy goats together, unless you do not worry about the same things I do. Which brings me to my sixth point, I can’t see how their lives with us were better than they would be in the wild. Chickens are pretty defenseless, goats are a prey animal, we provide them easy feed and a safe environment and they seem to like living with us. What could we give the ducks? For safety’s sake we kept them from flying, swimming in our nice pond, migrating in the winter, eating fish and all but the odd insect and we gave them instead a nasty little plastic kiddie pool and terrorized them every time we came in to feed them the dry food that they didn’t like and to collect their eggs. Sigh. And this returns me to the title of this post. We didn’t even manage to keep them safe. Monday night after I finished milking, I looked in on them and said, “goodnight, poor little ducks”. In the morning, one of them was gone. Something had dug under the side of the stall and snagged one, or perhaps she escaped and decided finally to migrate with her comrades, either way, it seems like we’ve done her a great disservice keeping her in suboptimal conditions that didn’t allow the full development of her duck-ness–creating a less-happy and more vulnerable animal. The other one (the kids are divided as to whether it was Anka or Nicka that is gone) is really, really unhappy now. She was pretty quiet before, now she quacks loudly and regularly and just wanders around looking lost. Poor thing. And I don’t know what to do. I don’t want her to be lonely, but I really don’t enjoy being a duck-keeper and I’m disinclined to get more. The kids and I thought for a few blissful hours that we had a neighbor with a bunch of drakes who could take her, but when I mentioned that idea to my husband he said he’d talked to her last week and that something had gotten her flock. What to do? It’s times like this that I feel heavily the stewardship of the lives entrusted to us. 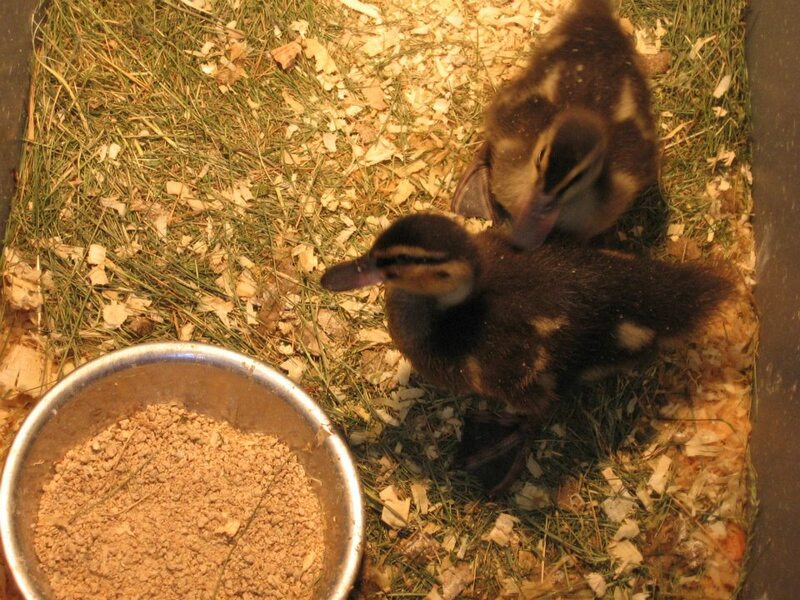 Anka and Nicka (“duck” and “to duck” in Swedish) in their younger, fuzzier days. Tags: ducks, the barnyard | Permalink.